Vitamin E Tocotrienol Complex — helps to ward off nature’s blows to your eyes, nerves, arteries, joints, and other organs. Vitamin E is the collective name for eight compounds found in nature: four tocopherols and four tocotrienols, all identified by the prefixes ‘alpha’, ‘beta’, ‘gamma’ and ‘delta’. LifeLink’s Vitamin-E Tocotrienol is a combination of all four tocotrienols plus enough alpha-tocopherol to provide the full range of vitamin E functionality. Nature is not kind to our bodies — it has an arsenal of ailments to hit us with. We can fight back in various ways, and this supplement is one of them. The best-known role of vitamin E is that of an antioxidant — i.e., protection of body’s tissues from damaging oxidative processes which arise both from normal metabolism and from toxic agents. In terms of antioxidant activity, the alpha-tocopherol form has been considered the most active; but recent research suggests that the other chemical forms may actually be equivalent or superior. A mixture appears to offer the best protection. 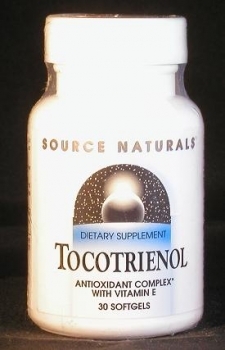 The tocotrienols have been shown in recent studies to have additional roles that do not seem to depend upon their antioxidant properties. For example, dramatic improvements in cholesterol levels in the blood have been achieved with tocotrienol supplementation. And gamma-tocotrienol has proved to be an inhibitor of the growth of liver, breast, and prostate cancers. Vitamin E supplements have been promoted for a variety of ailments. Applications for which there is scientific support include: tardive dyskinesia, restless leg syndrome, eye inflammation, preeclampsia, Alzheimer’s disease, rheumatoid arthritis, diabetes, stroke, cataracts, retinopathy, macular degeneration, and male infertility.